Go on a road trip to Ladakh and camp besides the famous Pangong Lake, drive over the world's highest motorable road, go rafting in the Zanskar River and ride an ATV in the sand dunes at Hunder. In this 7-day adventure-packed itinerary, you'll combine the exciting adventures of rafting with a road trip across the cold desert kingdom of Ladakh. Throughout the trip, as you battle the rapids of the Zanskar River, as you travel over winding high-altitude roads, you'll have dramatic views of Ladakh's barren mountains, as far as the eye can see. Apart from adventures in the stark landscape, you'll also get a taste of the Buddhist culture at famous monasteries, like the Diskit monastery, where you'll admire colourful artwork and giant sculptures of the Buddha. NOTE: Price mentioned is per person price for a booking of two travellers. Most popular for the endless stretches of mountain slopes, painted with different shades of brown and grey, the cold desert kingdom of Ladakh is also peppered with exciting adventures in rafting. The barren mountain slopes of the Ladakh range with snow-capped peaks are bisected with the glacier-fed riverbeds of the Indus, Zanskar and Shyok among many others. This dramatic landscape, navigable with some of the highest mountain passes in the world, makes for a strikingly beautiful destination in the Himalayas. 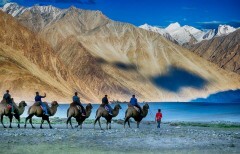 • Spend a week exploring Ladakh. • Go rafting in the rapids of the Zanskar River. • Visit the sand dunes of the Nubra Valley. • Get gorgeous views of Ladakh's stark landscapes. Leh's Rimpochee Airport (IXL) is well-connected to most major cities of the country via frequent flights by major airlines.